The internal combustion engine has suffered a new body blow, this time in the country that invented the modern car. Chancellor Angela Merkel hinted that it's only a matter of time before Germany follows France, Britain, India and other countries in banning new sales of cars fitted only with gas or diesel engines. 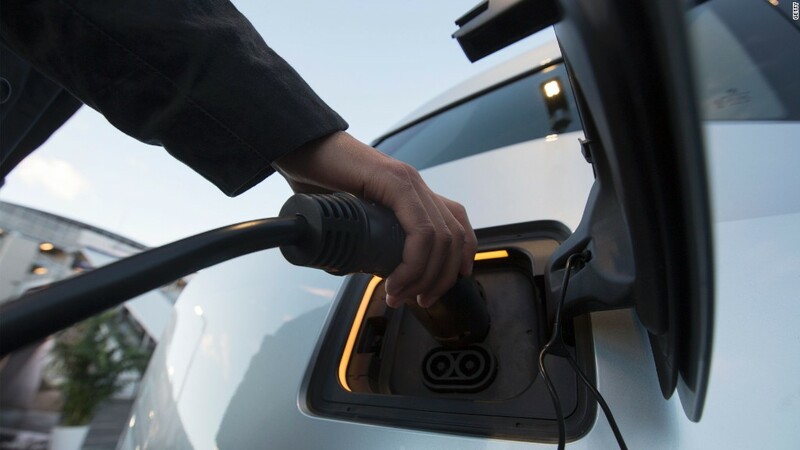 "I cannot name an exact year yet, but the approach is right because if we quickly invest in more charging infrastructure and technology for electric cars, a general changeover will be structurally possible." A German government spokesman confirmed Merkel's words in an email to CNNMoney on Monday. Back in 1886, Carl Benz applied for a patent for a "vehicle powered by a gas engine," giving birth to the modern automobile. Now making cars is Germany's biggest industry and export earner. Volkswagen (VLKAY) is the world's biggest automaker by sales, while Mercedes Benz-owner Daimler (DDAIF), BMW (BMWYY) and Porsche (POAHY) are also leading players. Merkel is seeking a fourth term as chancellor in an election on Sept. 24, and pressure has been building on her government to take a tougher stance on air pollution as a crisis over dirty diesel engines intensified. The scandal exploded nearly two years ago when Volkswagen admitted cheating on emissions by manipulating software so that diesel engines would run cleaner during tests than under normal driving conditions. Since then, more automakers -- including other German firms -- have been investigated for trying to do the same. Some German towns and cities have been threatening to ban diesel cars altogether, worried about elevated levels of pollution. And the reputation of the industry -- which is central to the "Made in Germany" promise of quality and reliability -- took another hit last month when European anti-trust officials said they were looking into claims that the carmakers had been operating an illegal cartel for years. After a crisis meeting between senior politicians and top executives last month, the German car industry agreed to modify more than 5 million diesel cars to cut emissions. Now it seems as if the government wants to go further, in part to meet its commitments under the Paris climate accord. "It is also clear that the climate targets we have set for 2050, namely a reduction in CO2 [carbon dioxide] of 80-95%, are very ambitious even if vehicle emissions of CO2 are significantly reduced," Merkel said in the magazine interview. Her remarks come as Germany's finance ministry admits that the diesel scandal could hurt Europe's biggest economy. In its August monthly report, the finance ministry added the "diesel crisis" to a list of economic threats that includes potential fallout from Europe's Brexit negotiations with the U.K. and President Trump's protectionist stance on trade. "Risks remain relating to the shape of Brexit and future U.S. trade policy. In addition, the so-called Diesel Crisis must be classified as a new risk, even though its effects cannot be estimated at present," it said. The finance ministry said data and surveys suggested the economy was on track for another good quarter in the June to September period. "However, the possible impact of the Diesel Crisis for the German economy cannot be quantified at present. Given the importance of the automotive industry, [the crisis] must be classified as a medium term risk to overall economic development," it added. -- Nadine Schmidt contributed to this article.